Alloy QA/QC in the aerospace industry is possibly one of the most important alloy QA/QC tasks in the world, because the consequences of a mistake or materials mix-up in an aerospace context can be extremely costly, or even deadly. Commercial aircraft components, for example, must be thoroughly checked and rechecked for correct alloy composition, since a slight difference in grade or composition can lead to corrosion or part failure. Such failures in aircraft parts can result in grounded flights, large financial losses, and—in the worst case scenario-loss of life. Choose the right QA/QC tool to avoid costly materials mix-ups: CONTACT BRUKER TODAY for a free demonstration or price quote for the S1 TITAN! In space vehicles such as space shuttles or satellites, an incorrect alloy used can result in a loss of millions of dollars, as well as thousands of wasted man-hours in research, engineering and manufacturing. Not only is there a huge financial and common-sense impetuous to run a tight alloy QA/QC program in an aerospace alloy context, but strict regulations and ISO requirements demand testing, grade verification, and traceability from base metals to components to finished product to in-use spot testing. Additionally, it has been shown that the absence of certain otherwise prohibited metals in satellite and spacecraft components can lead to filamentary corrosion-or tin whiskering-resulting in damage to circuitry, electrical shorting, and the possibility of total loss of satellite systems or significant failures in spacecraft electrical systems. Pb (lead) is an example of a metal element that helps prevent tin whiskers but is prohibited in the standard alloy manufacturing space. Therefore, it is exceedingly important that aerospace alloy manufacturers verify the PRESENCE of such elements, where other metal fabricators and manufacturers would verify their absence - see High Reliability Alloys. Considering the importance of using the right alloy every time in even the smallest component in the aerospace context, having the right QA/QC tools at your disposal is absolutely essential to running a successful operation. And, because of the complexity and relative rarity of aircraft and aerospace alloys, it is essential to have not only the state-of-the-art alloy analysis and verification systems, but also ones that can easily keep up with the pace of change as better, stronger aerospace alloys are engineered and become available. The Bruker S1 TITAN is the state-of-the-art, customizable tool you are looking for. Not only does theS1 TITAN boast a complete aerospace alloy library for quick, easy alloy grade identification and verification, but this library is user-upgradeable to account for changes and innovations in aerospace alloys. The S1 TITAN provides instant elemental analysis of castings, fasteners, electronic materials, solder, tin (Sn), titanium alloys, stainless steel, nickel superalloys, high-temp alloys, and more. 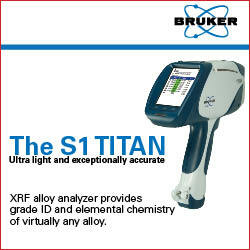 Contact Bruker today for a free demonstration of the S1 TITAN at your worksite or a price quote!